It is time to put an end to what people say is speaking in tongues and then go on to speak Gibberish! There are those who are speaking word’s inaudible at times and call it a language from God. IS THIS FROM GOD? When we search the word,God plainly answers any questions we have as Believers.The gift of tongues is no different than when Jesus spoke in parables,and the disciples would then ask what did that mean? He did’nt speak in an unknown gibberish,but the disciples heard his words then asked for an explanation of which then Jesus would explain in their own language. “And when he was alone, they that were about him with the twelve asked of him the parable. And he said unto them,Unto you it is given to know the mystery of the kingdom of God: but unto them that are without, all these things are done in parables:That seeing they may see, and not perceive; and hearing they may hear, and not understand;lest at any time they should be converted, and their sins should be forgiven them”.(Mark4:10-12). And what is this mystery he’s speaking of? “Even the mystery which has been hid from ages and from generations, but now is made manifest to his saints: To whom God would make known what is the riches of the glory of this mystery among the Gentiles; WHICH IS CHRIST IN YOU,THE HOPE OF GLORY: Whom we preach (NOT IN GIBBERISH),warning every man,and teaching every man in all wisdom; that we may present every man perfect in Christ Jesus”. (Colossians 1:26-28). We need to look at the meaning of this word Barbarian and know that none of the meanings described above are of someone who knows God’s knowledge.The gibberish people speak and say it is from God need to be aware when being a servant of Christ the word’s they speak are FOUND IN SCRIPTURE!,,just as Jesus would speak his Fathers words to explain his meaning. When the Holy Spirit gives knowledge of God to the believer it is of their own language spoken to feed many as seen here: “And there appeared unto them cloven tongues (seperate language),as the Spirit gave them utterance.And there were dwelling at Jerusalem Jews, devout men, out of every nation under heaven.Now when this was noised abroad, the multitude came together, and were confounded,because that every man heard them speak IN HIS OWN LANGUAGE.And they were all amazed and marvelled, saying one to another, Behold, are not all these which speak Galileans? 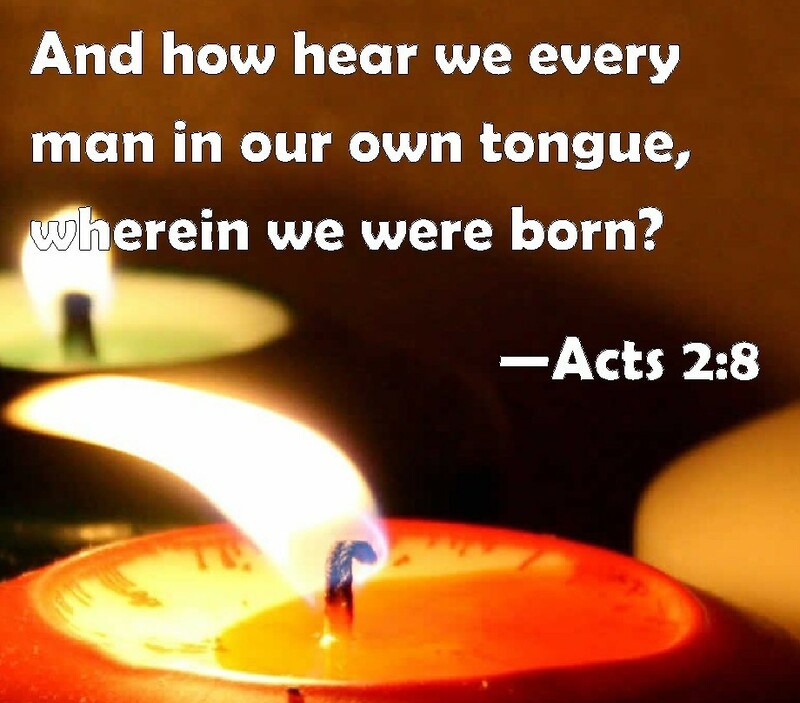 And how hear we every man in our own tongue, wherein we were born?”(Acts 2:3-8). Ever been all fired up about the Lord and with a group of people that look at you like deer in headlights? There’s nothing wrong with that,because God’s Spirit seperates and you are no longer of the world’s ways and if you were asked for meaning of what you just spoke you would BE ABLE TO SHOW ANSWER IN SCRIPTURE! Not go to a book of gibberish seperate from the bible that is probably out there in print somewhere saying it’s the language of God………NO! The only language of God is The Holy Written Word called the Bible. “How can the body of Christ be edified if you can’t understand Gibberish? “Else when thou shalt bless with the Spirit,how shall he that occupieth the room of the unlearned say Amen at thy giving of thanks, seeing he understandeth not what you sayest? For thou verily givest thanks well, but the other is not edified.I thank my God, I speak with tongues more than ye all. Yet in the church I had rather speak five words with my understanding, that by my voice I might teach others also, THAN TEN THOUSAND WORDS IN AN UNKNOWN TONGUE”. (1 Corinthians 14:16-19). Is this Gibberish some are speaking of God? No,because when one opens the bible the words you read you understand,because your reading it in your own language.If you speak english you purchase an english written bible….If you speak spanish then you purchase a spanish written bible and I suppose if you can find the BOOK OF GIBBERISH you can purchase that as well,but know it is Not The Word Of God. A True Servant Of God Speaks Only God’s Words To Edify The Body Of Christ. “And a stranger will they not follow, but will flee from him: for they know not the voice of strangers.I am the good shepherd, and know my sheep, and am known of mine”. (John 10:5,14).